"A very special property, the fact it is even available is a true opportunity." "Once sold there may never be another comparable property & setting available - ever." Listing locates property in Madeira Park. Say What?!!! 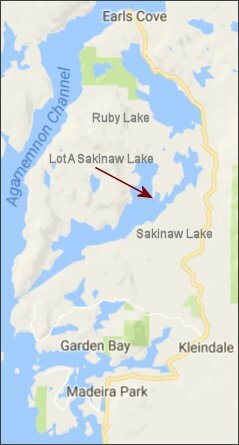 Heading north on Highway 101, it's Madeira Park > Kleindale > Garden Bay > Sakinaw Lake > Ruby Lake > Earls Cove. As well, looks like the someone couldn't be bothered to look up the property's postal code. 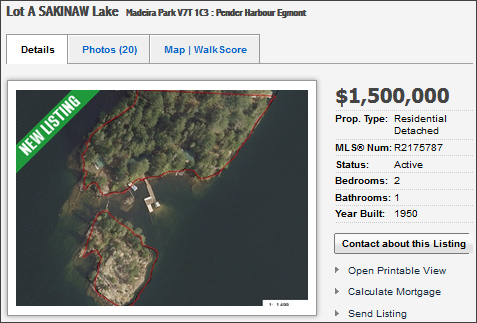 The listing image above shows V7T 1C3 - that's Re/Max Masters Realty's West Van postal code.